Vino Menu Covers come in two contemporary colors with a faux cork look and is perfect for your bar, cocktail or wine menus. The interior is made of black material with album style corners to hold your inserts. Vino Menu Covers are available with up to six views in five popular sizes so you can create a coordinating menu cover ensemble including dinner, wine, and dessert. 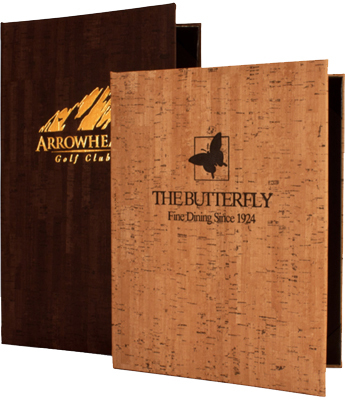 Vino Menu Covers can also be customized with your logo on the front hinge or back cover.